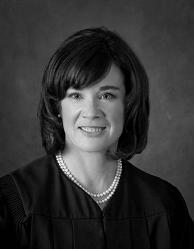 Beth Grimes was confirmed as an Associate Justice of the Second District Court of Appeal, Division Eight, in April 2010. Her judicial career began when she was appointed to the Los Angeles Superior Court in December 1997. Justice Grimes’ first judicial assignment was to the dependency court, after which she presided over a felony calendar court in what was then known as the Criminal Courts Building and later in independent calendar general jurisdiction courtrooms in the Stanley Mosk Courthouse and the Santa Monica Courthouse. Prior to her appointment to the Court of Appeal, from August 2004 through March 2005, Justice Grimes was assigned as a justice pro tempore to Division Four of the Second District Court of Appeal. A Phi Beta Kappa graduate of the University of Texas at Austin, Justice Grimes received her law degree in 1980 from Stanford Law School, where she was an Associate Editor of the Stanford Law Review. She also attended the Universidad de los Andes in Bogota, Colombia, for one semester during her senior year of college, and she attended Mount Holyoke College her freshman year of college. Before her appointment to the bench, Justice Grimes was a partner in the Litigation Department of Gibson, Dunn & Crutcher, engaged in a business litigation practice since joining the firm in 1980. She has extensive trial and appellate experience in federal and state courts involving a wide range of commercial litigation, including securities, bankruptcy litigation, partnership disputes, employment disputes, product liability, unlawful detainer and other general business disputes. While on the Los Angeles Superior Court, Justice Grimes was a member of the Executive Committee in 2008. She served on other committees of the Los Angeles Superior Court, including the Research Attorneys Committee, the Media Committee, the Bench Bar Committee, and the ADR Committee. She was a member of the JES faculty and taught courses concerning summary judgments, verdicts, anti-SLAPP motions, and employment law. She was a panelist on Legalworks’ Annual E-Discovery and Trial Practice Forums in February 2006 and 2007. She was a panelist for the CJA/Rutter Group Employment Litigation Programs in 1999, 2000, 2001 and 2002. She has presented lectures at Stanford Law School, USC Gould School of Law and Pepperdine University School of Law. While on the Court of Appeal, Justice Grimes has spoken on continuing education panels for ABTL, the California Academy of Appellate Lawyers, the State Bar, Pincus Professional Education, The Rutter Group, and the Association of California Insurance Companies General Counsel Seminar. Justice Grimes is a member of the Judicial Council Appellate Practice Curriculum Committee; a member of the Second Appellate District Technology and Library Committee and Rules Committee, and is also on the Editorial Board of California Litigation. Previously, she served as a member of the Judicial Council Advisory Committees on Civil Jury Instructions and on Civil and Small Claims, and was a member of the ABTL Judicial Advisory Council from 2014-2016. Justice Grimes has been active in community affairs. Over the years, she has sponsored numerous educational programs for children in her courtrooms; has served on the Board of Directors of Big Brothers Big Sisters of Los Angeles and the Inland Empire; chaired the mothers’ group of the Pinafores of the League for Crippled Children; and served as an AYSO coach and referee. She has served on the Board of Visitors of Stanford Law School and as co-chair of the Stanford Law Society of Los Angeles. She is devoted to the pursuit of good nutrition and fitness.